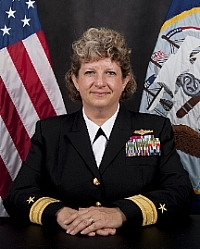 Rear Adm. Danelle Barrett graduated from Boston University in 1989 with a Bachelor of Arts in History where she received her commission from the Naval Reserve Officer Training Corps in a ceremony aboard USS Constitution. She holds Master of Arts degrees in Management, National Security/Strategic Studies, Human Resources Development and a Master of Science in Information Management. Barrett is the Navy Cyber Security Division director. She has published 28 articles. See full bio here. Watch video of Rear Admiral Barrett here. Deadline to register is 48 hours before event. Any registration that comes in after this deadline will be put on a waiting list and billed an additional $5 (if space allows). Registrations must be canceled the day prior to the luncheon by 12 pm in order to receive a credit. If not, you will still be billed. All cancelations must be made over the phone to ensure staff is aware of your cancelation. Thank you.